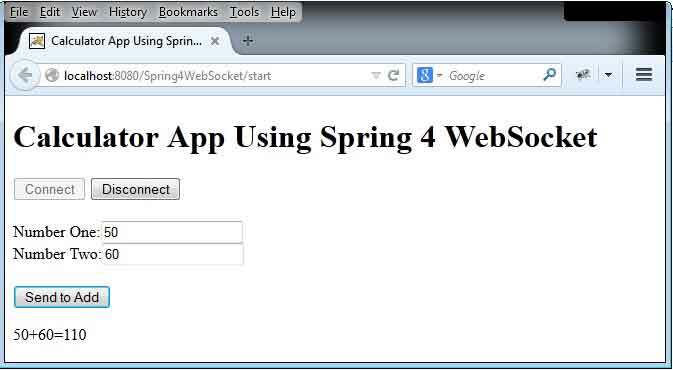 This page provides the description and example of Spring 4 WebSocket. Spring 4 has introduced the WebSocket API using which a browser and web server can communicate over WebSocket protocol. In this way, we can create a highly interactive UI and Online Games which needs quick response from the server. Higher version of browser supports WebSocket protocol. To describe WebSocket, I am creating a simple calculation application. SockJS provides the WebSocket like object on UI. STOMP client is being used to communicate over WebSocket protocol. I am using tomcat server to deploy the project. Find the diagram which displays the WebSocket Communication. WebSocket is a protocol which communicates between browser and web server. WebSocket works over TCP protocol. It opens a socket connection between browser and web server and start communication. WebSocket embeds sub protocol easily. 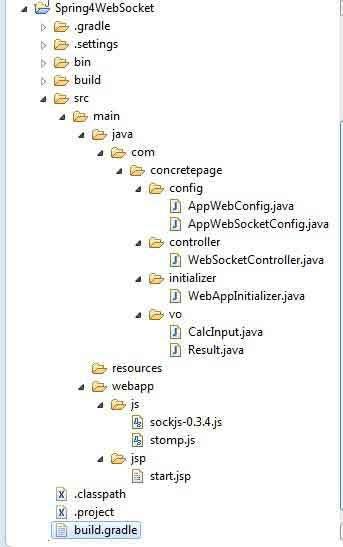 In our example we are using STOMP over WebSocket . SockJS is a java script library which provides websocket like object for browsers. SockJS provides cross browser compatibility and supports STOMP protocol to communicate with any message broker. SockJS works in the way that we need to provide URL to connect with message broker and then get the stomp client to communicate. STOMP is Streaming Text Oriented Messaging Protocol. A STOMP client communicates to a message broker which supports STOMP protocol. STOMP uses different commands like connect, send, subscribe, disconnect etc to communicate. Below software are being used to run the Spring 4 WebSocket Example. Find the eclipse screen shot which shows the project configuration of our calculation application example. We are using two configuration class one for WebSocket configuration and another for Spring MVC. Find the WebSocket configuration. Now check the Spring MVC configuration. We have imported WebSocket Configuration here. EnableWebSocketMessageBroker has been introduced in Spring 4. EnableWebSocketMessageBroker annotation enables a configuration class to support WebSocket. This annotation supports message broker. AbstractWebSocketMessageBrokerConfigurer has been introduced in Spring 4. This class is extended by WebSocket Configuration class. We need to implement two methods of this class configureMessageBroker() and registerStompEndpoints(). MessageBrokerRegistry has been introduced in Spring 4. This class helps to register message broker. We can enable simple broker for topic and queue conventionally. topic : Use topic when there are more than one subscribers for a message. queue : Use queue for peer to peer communication. StompEndpointRegistry has been introduced in Spring 4. StompEndpointRegistry register an end point for the STOMP over WebSocket. Check the below code snippet. @MessageMapping annotation has been introduced in Spring 4. The method annotated with @MessageMapping works for WebSocket protocol communication. This defines the URL mapping. In our example add is URL pattern for WebSocket Comunication. @SendTo has been introduced in Spring 4. Once the request has reached to server over WebSocket, a calculation or any business logic is performed on the data and result is prepared. Now we need the URL pattern where the result will be sent and for this task @SendTo comes into picture. @SendTo defines a URL pattern to send result. In our example we have URL pattern as /topic/showResult . Find the web application initializer class that supports servlet web.xml configuration and no need to use web.xml. We have two value object, one for request data and second for response data. Find the class to get JSON data from request. Find the class to send JSON data as an response. We have a UI that has button to connect and disconnect and two input text to get number. Result is also displayed here getting from server. UI is using two JS library sockjs-0.3.4.js and stomp.js. Find the gradle script for JAR dependency. Find the steps to run the calculation application. 1. Download source code and go to root project using command prompt. 3. Deploy WAR in tomcat. 6. Enter number in text fields to add. 7. Click on Send Button. 8. After some time result is displayed.